While there’s been ski racing in the Lake Placid area as far back as 1921, Mount van Hoevenberg is a comparatively recent development in Lake Placid’s long winter sports tradition. Beginning in 1954, Lake Placid submitted seven bids for a second Winter Olympics over a 20-year period. The U.S. Olympic Committee accepted three of those bids, and in 1974 Lake Placid was awarded the 1980 Winter Olympics. Mount van Hoevenberg was already the site of the state-owned bobsled run that had seen the 1932 Winter Games. 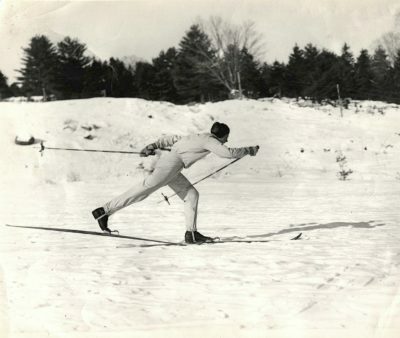 In the early 1960s, cross-country Olympian Joe Pete Wilson surveyed the area and thought it a good location for ski trails. Planning long-term for a second Winter Olympics, Ron MacKenzie and J. Vernon Lamb Jr developed the first trails in 1966 or 1967. On one side of the present-day access road, they cut five kilometers around East Mountain. This is what is now known as the “cross-country” side of the trail system. On the other side of the road, another 10 kilometers were laid out. This section was referred to as the Pumphouse Loop, and encompassed part of what is now the Perimeter Loop. The nascent trail system played host to the Kennedy Games in 1969. In a letter to the American Athletic Union (AAU) shortly before his assassination, the late President John F. Kennedy suggested a streamlined version of the Olympic Games, held in the U.S., might further international understanding. Other sources say the Kennedy Games were part of an AAU drive to endow a fund to train athletes aspiring to the Olympics. Both summer and winter versions of the Kennedy Games were planned. Three hundred athletes from 18 countries came to Lake Placid to compete in a variety of disciplines, including cross-country skiing. Originally, the Kennedy Games were to be held in non-Olympic years. A 1969 newspaper article states that Lake Placid would host “the first three years” of the Kennedy Games. It’s unknown whether there were Kennedy Games following the inaugural year. Lake Placid also played host to the 8th World Winter Games for the Deaf in 1975, and the cross-country events happened at Mount van Hoevenberg. After Lake Placid won the 1980 Winter Olympics, build-out of the stadiums, biathlon range and race loops began in earnest in 1976 or 1977. Wendall Broomhall, a 1952 Olympian and the chief of [cross-country] competition for the 1960 Olympics in Squaw Valley, was the chief of course at Mount van Hoevenberg. Broomhall supervised the improvement of existing trails and laid out 40 km of new trail. NY Department of Environmental Conservation employees and inmates at the Ray Brook correctional facility cut trees and put in trails. Mount van Hoevenberg held pre-Olympic test events in 1979. While cold, the winter of 1980 was the worst for snowfall in nearly 100 years. Starting in January 1980, organizers used 16 snowmaking guns to stockpile manmade snow. A monumental effort was required to move snow and cover 25 km of trails with 10 inches of snow. While most of the snowmaking was on-site, some snow was made at the ski jumps and trucked to Mount van Hoevenberg. This Olympics saw what was then the closest finish in a cross-country ski race. At the finish of the men’s 15 km race, Sweden’s Thomas Wassberg nipped Juha Mieto of Finland by .001 second. Following the Olympics, Mount van Hoevenberg joined Whiteface and other Olympic venues as stewards of the newly created Olympic Regional Development Authority. Since then, van Ho has been the site of numerous top level competitions, including the U.S. National Championships, the cross-country trials for the 1998 Winter Olympics, biathlon national championships and a biathlon world cup. A SuperTour race was held there in 2010.